Some businesses get it, and some REALLY GET IT! By “IT” I mean the customer service WOW experience. Rick and Martine work at the Sherwood Park Greyhound, and Charmaine was in line on a very busy day several days before Christmas. They made the line up wait more than bearable, in fact, they made it fun. 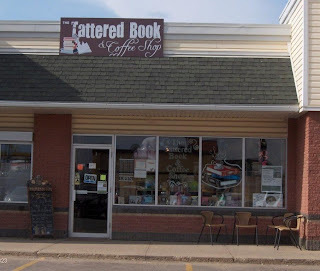 Despite being run off their feet, they greeted every person who walked through the door with a sincere smile, made eye contact, and kept people in conversation. They seemed to be having fun. 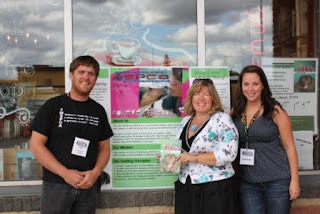 The energy created a ripple effect of pawsitivism through the crowd. Then, the icing on the cake was when Rick coordinated all the children in the line to join in together to sing Away in a Manger. This was one of Char's Christmas highlights. I was at the Greyhound for half an hour and Charmaine did not see one person shifting, sighing or shuffling or rolling their eyes or making comments about the wait. This is an example of a team that gets IT and customers left in a great frame of mind, which is a benefit for the staff in the business they will visit next. Char will be following up with a shout out to Greyhound to acknowledge these staff, and to our community newspaper. I love Wednesdays because it is my afternoon to volunteer at Alberta Hospital Edmonton, however, because of the PAWlidays, I am doing some extra volunteer time with the patients. I had a great time this evening visiting with eight patients. The patients always tell me how much joy I bring them, I often wonder if they know the feeling is mutual. My volunteer time is the highlight of my week! 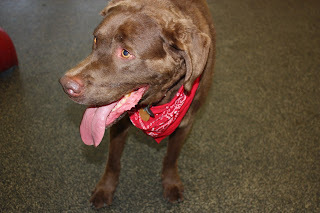 Four PAWS up to Doggie Day Cares! I love doggie daycare! It gives me a chance to socialize with other furry friends, and is a great opportunity for play. When I go to doggie daycare, I am tired when I get home, and sleep soundly. 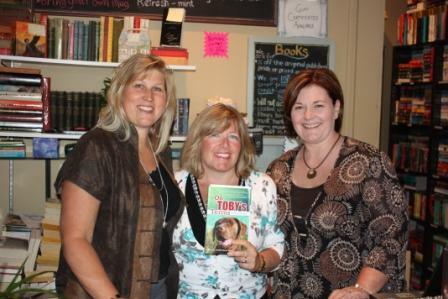 This past weekend I had another great book-signing at Chapters Strathcona in Edmonton. It was my first time to this bookstore. I was quite intrigued by the escalator and stepped on with confidence until the stairs started to move. Whoa! What’s with this? Moving stairs? After Christopher took me up and down several times I was a pro. What a great lesson that there is always a first for everything, but only once. With a little practice and repetition, you can become a pro. What will you try this week for the first time? How can you help someone step into something new for the first time? Just like Christopher held my leash firmly and I knew I was supported, you can do that for someone else. Have a PAWsitive week and great success to any first times you have this week! Tonight the doorbell rang, and I tore down the stairs because I heard the giggling from the two little girls on our block. Charmaine opened the door and they asked for Chris. Smiling they said “Can Chris come out and pull us on our skateboards?” I ran to get my kong because I knew this could be fun for me. Into the garage Chris went searching for a tow rope, and we all ventured outside. What I was reminded of tonight is that friendship is ageless! Here we are having fun, two legged and four legged friends. Cherish your friends, and let them know that they make a PAWsitive difference in your life! You CAN(field) Teach Toby New Tricks! My mom and I have learned a ton over the past couple of years. 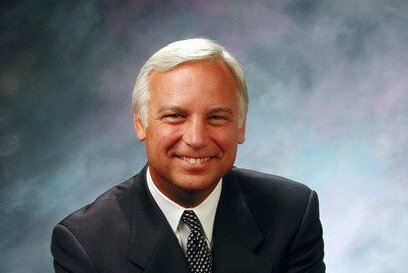 One person who contributed to our learning is Charmaine’s mentor, Jack Canfield, co-author of Chicken Soup for the Soul book series. 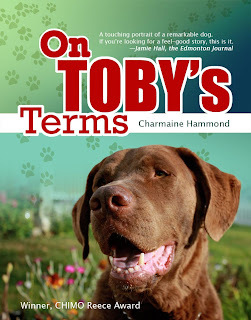 Charmaine was in his Success Principles Coaching Program, and Mr. Canfield provided an endorsement for my new book, On Toby’s Terms! I am barking up a storm to tell you that Jack is coming to Edmonton! He will be presenting at the Winspear on October 28 in the evening, and I am pawprinting a special book to give to him. We are one of the sponsors of the event, and Charmaine has some tickets (where you save 10% and the administrative fees). Call or email Charmaine at 780-464-3828 or charmaine@hammondgroup.biz to get your tickets now. Don’t miss the opportunity to attend this event and listen to the mentor that gave us a leg up in life! A day to celebrate you! This past weekend it was my birthday. Even though I wore this silly hat, I was secretly smiling to myself, because I knew that it was my special day! It was clear that people were celebrating me! What can you do everyday to celebrate YOU? Why wait for a birthday, NOW is the time to celebrate you and those around you. What a great time I had this weekend (at K9 Awarness Centre in St Albert) meeting and playing with many new four legged friends! 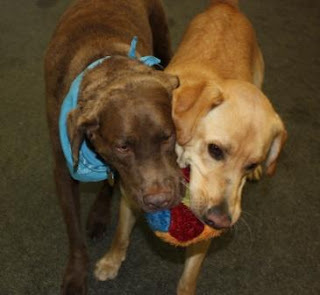 My friend and I both had our eyes on the same goal…A beautifully coloured plush ball (with a squeaker inside). As you can see, we learned to collaborate and instead of hogging the ball, we decided to share. This made for a lot of fun. What are you doing this week to seek opportunities to collaborate and keep your eyes on the goal? What a great event this week at K9 Awareness Centre in St. Albert (http://www.allseasonk9awarenesscentre.com). Along with many other dogs, we kept the treadmills going to raise funds for Vets Without Borders. Thank you to the many supporters, contributors and sponsors who donated items for the silent auction and of course big barks of thanks to the dogs and the two legged friends for attending the event! Your support made a big difference! The Bone& Biscuit Company in Sherwood Park provided us with incredible dog treats for our “guess how many treats are in the jar?”, which alone, raised $49 for the cause… that is a lot of guesses. Here I am jogging to make a difference. Toby barks out a PAWsitive THANK YOU to Sobeys in Fort McMurray for generously donating cookies and lemonade for us to sell as a FUNdraiser for the SPCA during my book singing and PAWprinting on Sunday August 29, 2010. 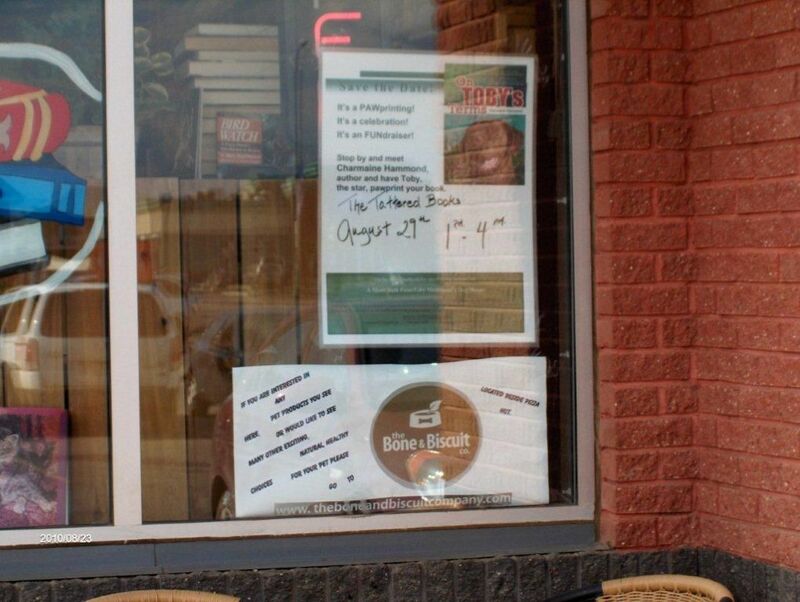 Another Bark Out Thank you to the Bones and Biscuit in Fort McMurray for generously donating healthy dog treats for our FUNdraiser for SPCA, and big PAWsitives to the Tattered Book & Coffee Shop for hosting the event! Big thanks to Your Perfect Fit, and the Connect and Fort McMurray Today for covering the story. And Four PAWS up to Jackie Fidder our dear friend, for all her help organizing it. Toby in Carmel Valley News article! Here is the link to the news article. Toby and his friends at the Tattered Book, Bone and Biscuit, Your Perfect Fit and Sobey's helped to raise nearly $500 for the Fort McMurray SPCA last Sunday! Wow- what a PAWsitively amazing summer so far. 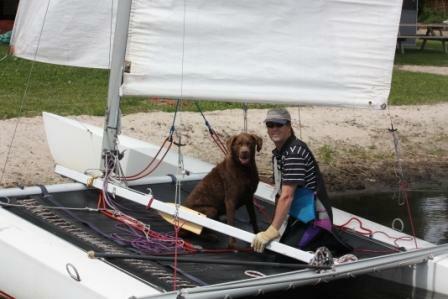 I have enjoyed loads of time at the cottage on the lake swimming, chasing balls and birds, snoozing on the beach, playing with my BFF and now I am learning to sail! My book, On Toby’s Terms, is in the process of being printed. Watch my website for launch details, my new media package, and events that I’ll be at. Check out my new photos on my website. I have enjoyed the emails that are coming in from my fans! Thank you. On June 1, 2010 at approximately 8:15 a.m., I was arrested for “Doing Cannonballs in the Pool.” Dressed in my striped jailbird (or jaildog) uniform and cuffs, I was read my charges and put behind bars. Of course being the sneaky dog I can be, I made my run for freedom at the first available opportunity. The police were quick and brought me back behind bars. Once the judge was assured we would raise the bail, I was released. This was a PAWsitively great way to start the week, supporting a good community cause GETFEST Edmonton Project 27, and having fun! This week I invite you to PAWS for a while and seek opportunities to appreciate the freedoms that you have and how these make our world a better place. Until next time, wishing you a PAWsitive week! Putting my pawprint on what I believe in is important; it is about taking a stand for what I believe in. I know I am drawn to people who do the same, when you are authentic, it shows. I sense it and others see it. Your values define your character and are a part of who you are. The other day I was watching a little girl in a stroller surrounded by a bunch of adults. Her unfiltered authenticity was precious, her curiosity and intrigue about these adults was so pure. This week I encourage you to find ways to let your values and authenticity be shared with others, the gift of sincerity! This is the second year that we have participated in the “Pitch In” Community Clean Up Program. My family and I go and clean the parks and walkways around our block and behind our home. This year it was again disappointing to see all the broken glass that is on the pathways from people smashing bottles. It is dangerous for children and all my four legged friends. Keeping our parks clean and safe is important, for all of us. This week, we are going to make a difference by writing a letter to the County and request two garbage cans be installed on the pathways by our home. We will go one step further…I will PAWprint the letter, as I bet the County has never seen a letter signed by a dog resident of the community. Perhaps the creative approach will garner support faster. What is one thing you can do this week to care for your community? Together, we can make a difference in making our communities a safer and more beautiful place to live! 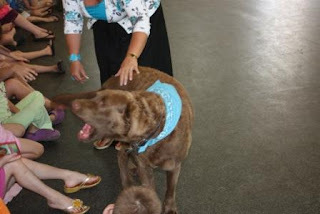 It is hard to believe that I have already been volunteering as a Pet Assisted Therapy Dog for more than two years. Wednesdays are my favorite day because I am living my passion and purpose as a volunteer. This week the hospital recognized my volunteer efforts with a lovely card, and a gift card for Pet Smart (my favorite store). Volunteering from the Heart is about connecting with people, making a difference and about being fully present! I know the patients appreciate me being there on Wednesdays, but, I also value and appreciate them. They make a difference in my life! We are also celebrating Earth Day on Sunday as we participate in the “Pitch In” neighborhood cleanup event! We will be cleaning up the parks in our neighborhood, and will be asking the County to put another garbage can along the walk way to reduce litter. Together, we can make a difference! Through our single efforts, we can make a wave of change. Whose this handsome pup on the treadmill? It's me!! Congratulations K9 Awareness for a great event! 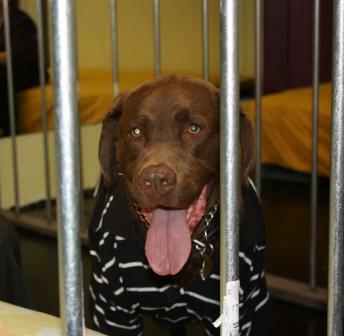 A PAWsitive fundraiser for the Edmonton Humane Society, and all us four legged friends had a barking good time! This is a four paws up day! 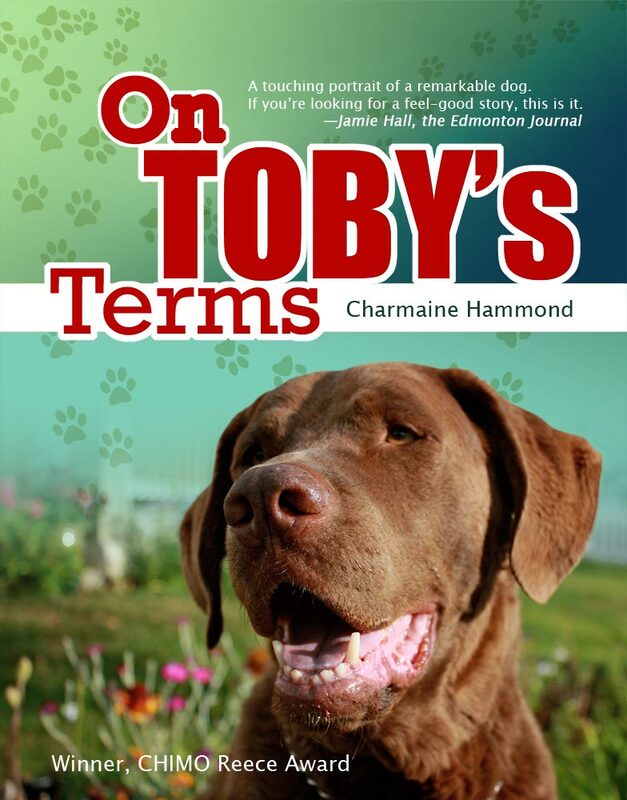 We just got word that our new book On Toby’s Terms- a story of life, love and purpose, written by Charmaine is now listed on Amazon. The book will be in bookstores everywhere September 2010. Thank you all for your support, encouragement and for celebrating with us! Spring is almost here! There were all kinds of great discoveries in my backyard after the snow melted. I found a bunch of tennis balls, my long lost cat (stuff animal) and a few other treasures. We are fortunate to be surrounded by great parks and walking paths that we use regularly. I am participating in the 44th annual Pitch In Canada Campaign later this month. I am going to assist Char, Chris and our neighbourhood friends in pitching in to clean the parks and paths by our home. If we all do our part, the world will be a cleaner place. Woof Woof for now. I am so excited! 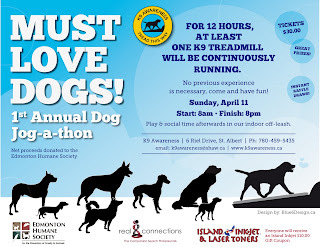 !I am going to be in a Dog Jog-A-Thon (on a dog treadmill) this weekend (Sunday April 11, 2010) at All Season K9 Awareness Centre in St. Albert. It is a fundraiser for the Edmonton Humane Society. If you would like to sponsor me to jog and raise funds for the Humane Society, just let me know, we’d be grateful. Hope you can drop by and bring your four legged friends. Woof Woof. 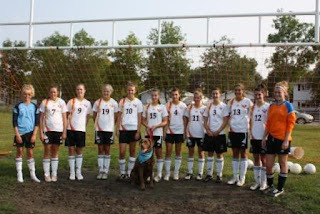 Toby is a proud sponsor of the Sherwood Park Phoenix Elite Girls Soccer team, an incredible group of young athletes! As they prepare for Provincials, Charmaine went to their recent team lunch to present a PUP talk on behalf of Toby. Charmaine shared a series of lessons of teamwork that she has learned from working on a team with Toby every Wednesday as they volunteer at the hospital. 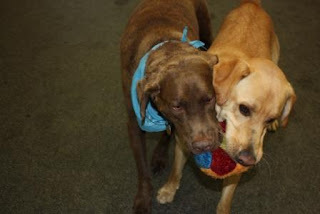 · Play with spirit, focus and communication…and have FUN! Toby wishes the team well at their upcoming Provincials. There are many people who come into our life for a reason and make a difference. It is an honor to know Karin Overgaard, a Certified Master Pet Trainer, and Volunteer Coordinator with CHIMO Animal Assisted Therapy Project. 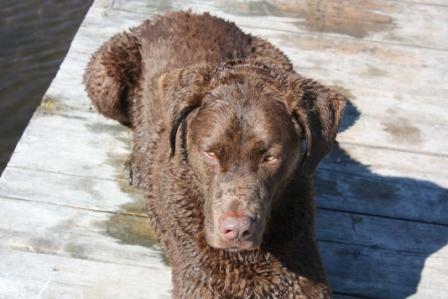 Karen also has her own practice, visit her at www.doghelp.ca. We first met Karin through CHIMO, as our dog Toby is a volunteer through the program. 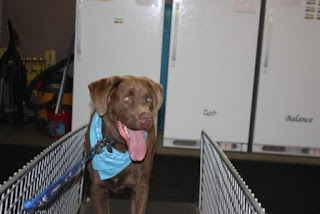 I have also had opportunity to consult with Karin about Toby and her guidance, suggestions and modeling how to deal with our dog’s behavior has been incredibly valuable. Not only does Karin make a difference in the lives of the animals (and the humans) she works with, she also strives to make our world a better place. 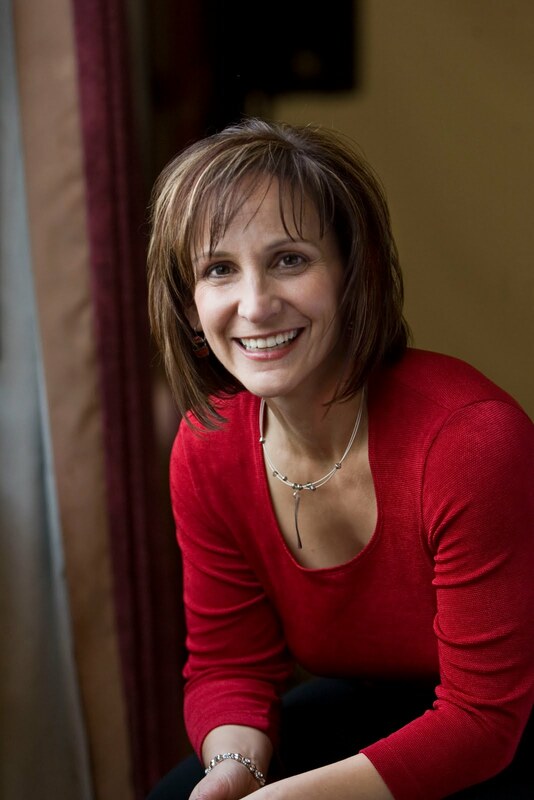 Thank you Karin, for making a difference! Cesar Millan, the dog whisperer, advised that January is “Walk your dog month”. I am chomping at the bit to get going. I enjoy regular walks and play however; I injured my leg last week. The arthritis in my leg was causing me some pain and I twisted it making it worse. 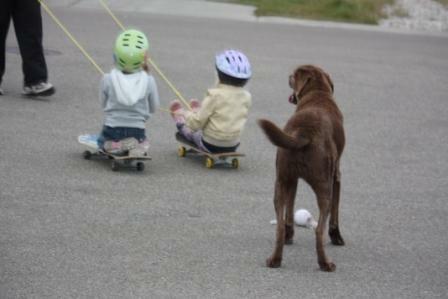 You are not too late to jump on board for walk your dog month! Happy Stepping. Have you made a New Year’s resolution for your pet? Happy New Year to you and all the animals you love! A recent article in the Post-Gazette.com said that increasing your daily exercise and play with your pet is an important resolution to keep, for you and your animal. Increasing play, focused fun and exercise can curb mischievous behavior. I know that when I am bored, restless or have lots of energy to burn off, I am much better behaved (ok… well sometimes). 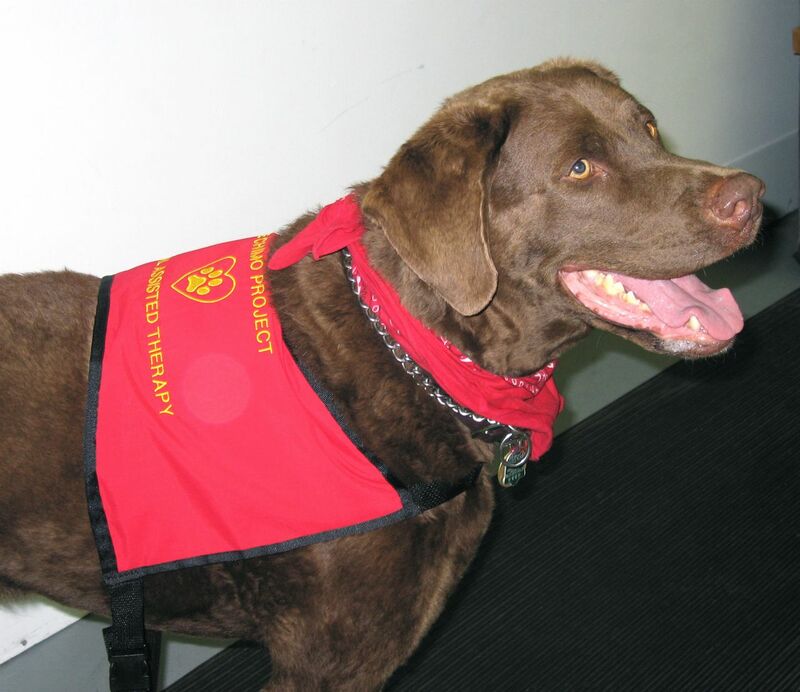 The Purdue University School of Veterinary Medicine suggests that if your pet is social, gentle, patient and people oriented, you may want to consider certifying it as a therapy animal. 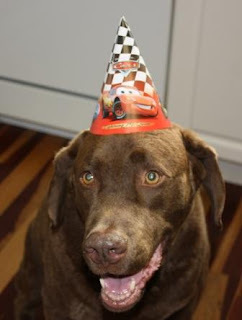 This is something you can do with your pet, and bring joy to many. We have this base covered. 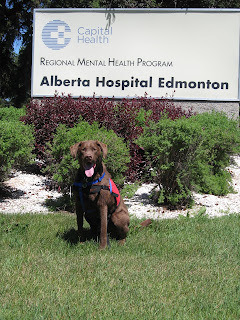 I am a pet assisted therapy dog with Alberta Hospital and I love Wednesdays- on these days, I live my passion working, playing and spending time with patients at the hospital. It is a win win situation, the patients benefit and, they add something very special to my life! And I know Charmaine loves Wednesdays too because she gets to volunteer with me. To everyone who read my blog and PAWsitive Inspirations in 2009, and to everyone who e-mailed me, Thank you for reading, thanks for following me and thank you for caring. Let’s make it a great year for pets everywhere!